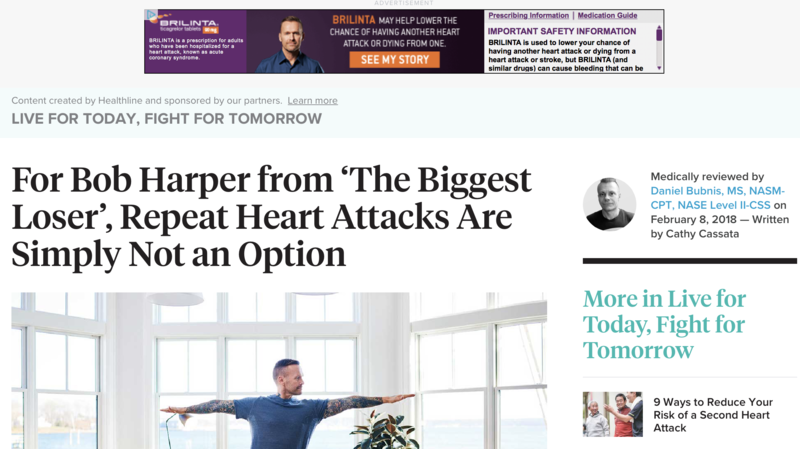 What Can You Really Learn From Celebrity Bob Harper’s Heart Attack And Near Sudden Death? When celebrities die suddenly (see Garry Sanders, Carrie Fischer) or have a heart attack at a youngish age despite an apparent healthy lifestyle this get’s people’s attention. The media typically pounce on the story which combines the seductive allure of both health and celebrity reporting. It turns out Harper inherited a high Lipoprotein (a) (see here) which put him at high risk for coronary atherosclerosis (CAD) which ultimately caused the heart attack (MI) that caused his cardiac arrest. To his credit, Harper has talked about Lipoprotein (a) and made the public and physicians more aware of this risk factor which does not show up in standard cholesterol testing. Since his heart attack, Mr. Harper of “The Biggest Loser” has embarked on a newfound mission to raise awareness about heart disease and to urge people to get tested for lp(a). Unfortunately , he has also become a shill for Brilinta, an expensive brand name anti platelet drug often prescribed in patients after heart attacks or stents. At least this video is clearly an advertisement but patients and physicians are inundated by infomercials for expensive, profit-driving drugs like Brilinta. This Healthline article pretends to be a legitimate piece of journalism but is a stealth ad for Brilinta combined with lots of real ads for Brilinta. Harper also changed his fitness and diet regimens after his MI reasoning that something must have been wrong with his lifestyle and it needed modification. For the most part he talks about more “balance” in his life which is good advice for everyone. His fitness regimens pre-MI were incredibly intense and have been toned down subsequently. After his heart attack, Bob abandoned the Paleo lifestyle for the Mediterranean diet, as it’s been proven to improve heart health and reduce the risk of a heart attack, stroke, and heart-disease-related death by about 30 percent. But recently, he’s moved closer to a vegetarian regimen. Unfortunately there is no evidence that changing to a vegan or vegetarian diet will lower his risk of repeat MI. Those who promote the Esselstyn, Pritikin or Ornish type diets claim to “reverse heart disease” and to be science-based but, as I’ve pointed out (see here) the science behind these studies is really bad. In fact, we know that neither diet nor exercise influence lipoprotein(a) levels which Bob inherited. Some individuals just inherit the risk and must learn to deal with the cardiovascular cards they’ve been dealt. 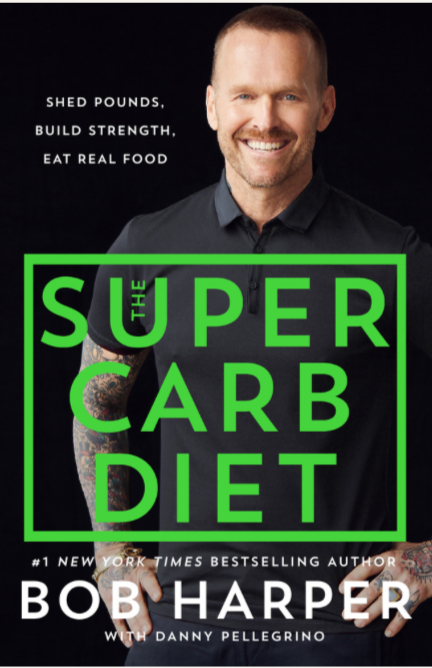 What Can We Really Learn From Bob Harper’s Experience? Lipoprotein (a) is a significant risk marker for early CAD/MI/sudden cardiac death. Consider having it measured if you have a a) strong family history of premature deaths/heart attack (b) if you have developed premature subclinical atherosclerosis (see here) or clinical atherosclerosis (heart attack, stroke, peripheral vascular disease) or (c) a family member has been diagnosed with it. Everyone should learn how to do CPR and how to utilize an AED. (see here for my rant on these two incredibly important 3-letter words). Harper was working out in the gym when he collapsed. Fortunately a nearby medical student had the wherewithal to do CPR on him until he could be defibrillated back to a normal rhythm and transported to a hospital to stop his MI. Dropping dead suddenly is often the first indicator that you have advanced CAD. If you have a strong family history of sudden death or early CAD consider getting a coronary artery calcium scan to better assess your risk. Focus on celebrities with heart disease helps bring awareness to the public about important issues but we can only learn so much about best lifestyle or medications from the experience of one individual, no matter how famous. If you have had a heart attack at an early age or one of your parents did but your standard risk factors for coronary heart disease are normal you should consider getting tested for Lipoprotein(a) or Lp(a). The skeptical cardiologist tests such patients for Lp(a) (pronounced LP little a) and it is quite frequently elevated. It is the strongest single inherited (monogenetic) risk factor for the early development of coronary artery disease, heart attacks and strokes. In addition to increasing risk of atherosclerosis, high Lp(a) is strongly associated with the development of calcific aortic valve disease which can result in narrowing of the aortic valve and aortic stenosis. Levels of Lp(a) can be measured with a simple blood test that should cost no more than 50 to 100$. This is not included in standard lipid or cholesterol testing. Risk for heart attack starts to rise with levels above 30 mg/dl and Canadian guidelines from 2016 (see here)) consider >30 mg/dl to be a risk factor and they recommend measuring Lp(a) in those with a family history of premature CAD or those at intermediate risk. 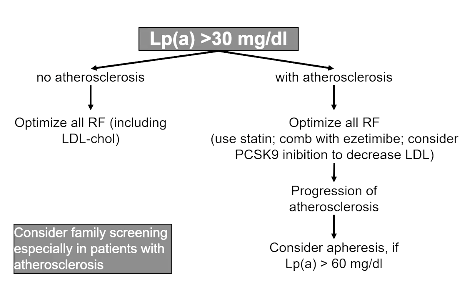 The European Atherosclerosis Society (EAS, 2010), suggested levels of <50 mg/dl as optimal. The EAS advised measuring Lp(a) once in all patients with premature CVD. The lifestyle changes (both exercise and diet) that improve bad and good cholesterol levels have no effect on Lp(a). Our best drugs, the statins, for reducing risk of heart attack and stroke also don’t lower Lp(a) levels. Cholesteryl ester transfer protein inhibitors which raise HDL levels also reduce lipoprotein(a) concentrations, but three such inhibitors have not shown a clinical benefit. In fact, currently there are no studies showing that lowering Lp(a) with any drug will effectively lower the associated risk of heart attack, stroke and aortic stenosis. In the not too distant future, effective therapies may emerge. There are promising newer agents (antisense oligonucleotides or ASOs) currently in clinical trials and in limited populations the PCSK9 inhbitors, mipomersen and estrogen have lowered Lp(a) levels. If we have no effective therapies that work by lowering Lp(a) why recommend testing for it? I test Lp(a) for two reasons. First, since it is inherited, patients with high levels should consider having first degree relatives tested for Lp(a) to identify those who are going to be at high risk. This provides an early warning of who in the family is most at risk for cardiovascular complications early in life. Such patients should be considered for early screening for subclinical atherosclerosis. In addition, they should be additionally motivated to do everything possible to reduce their elevated risk by lifestyle changes. With this approach for patients who have had events related to atherosclerosis or advanced CAC for age we work super aggressively on optimizing all risk factors. I try to lower LDL to <70 with statins and with the addition of ezetimibe or PCSK9 inhbitors if needed. If the patient has more problems with atherosclerotic events despite optimizing risk factors and Lp(a) >60 mg/dl, some experts recommend using apheresis a technique which runs the patient’s blood through a filter which removes LDL and Lp(a). Personally, I have not sent any patients for apheresis and await better studies proving its benefit. There is a Lipoprotein(a) Foundation with reasonably informative and accurate website you can peruse here for more information. Finally, if you want to delve deeply into the data check out this recent JACC review here. 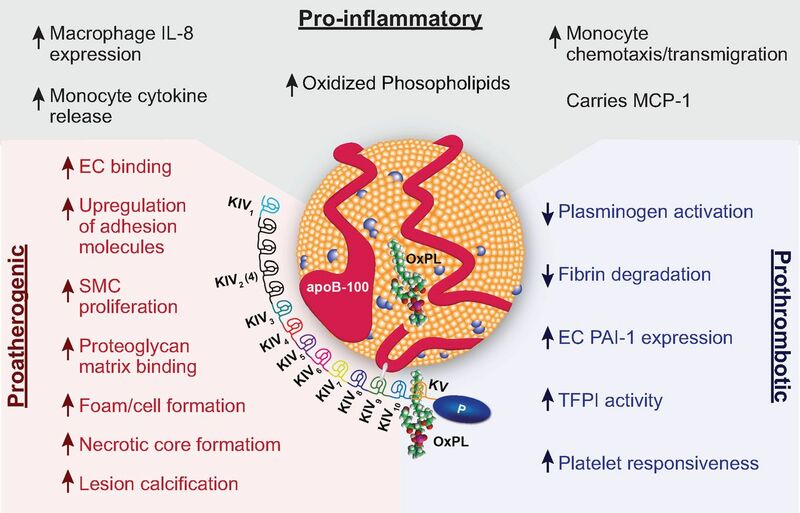 showing the proposed pro-inflammatory, pro-atherogenic and pro-thrombotic pathways of Lp(a) are from that article. Is Your Generic Medication Made In China and Is It Safe?